The Art Newspaper is a monthly UK publication that was established in 1983 to cover the international visual arts field. 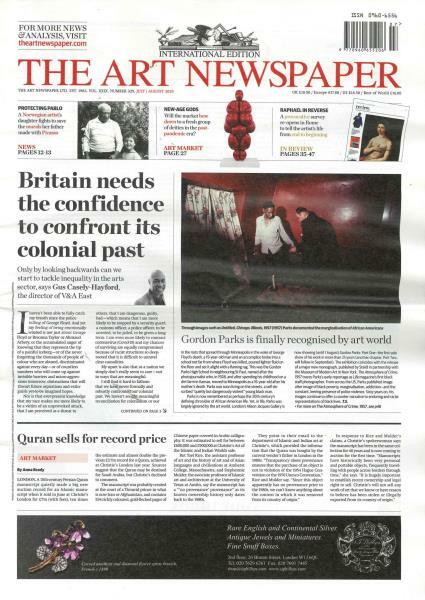 Buy a single copy or subscription to Art Newspaper magazine. The Art Newspaper is a monthly UK publication that was established in 1983 to cover the international visual arts field. The publication is a trade newspaper for the art professional including artists, gallery owners, museum directors, collectors and auction houses. The newspaper provides invaluable information for those in the art world in terms of trends in the art market, art sales, art theft, and news on art personalities and art connoisseurs. Art Newspaper has five sister publications located in different countries including Giornale dell’Arte in Italy, Ta Nea Tes Technes in Athens, Le Journal des Arts in France, and the Art Newspaper Russia. The network of international publications provides a worldwide editorial perspective to each publication including Art Newspaper. In Art Newspaper, you will the nitty gritty of the art world, with behind the scene information on the economics and the politics of the art business. You will get information on court battles over art, legal battles to protect public art, news of racial backlashes against certain types of art, and news on how communities come together to save historical art.